Tuesday, February 16 through Sunday, February 21, 2016-San Diego, California: Yep…..still here! And, as we did last week while camped at the Admiral Baker Recreation Facility, Kit and I continued to play tourist in the hometown of our youth…..San Diego. 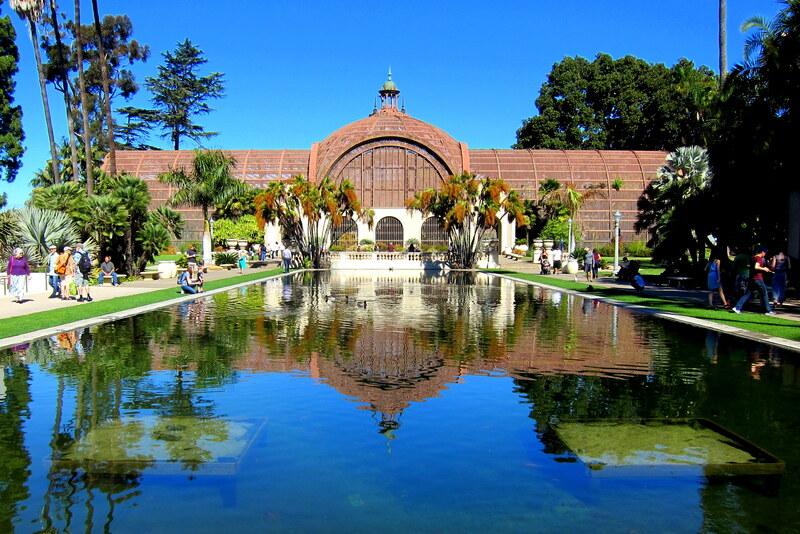 So, off we went to one of this city’s crown jewels…..Balboa Park. 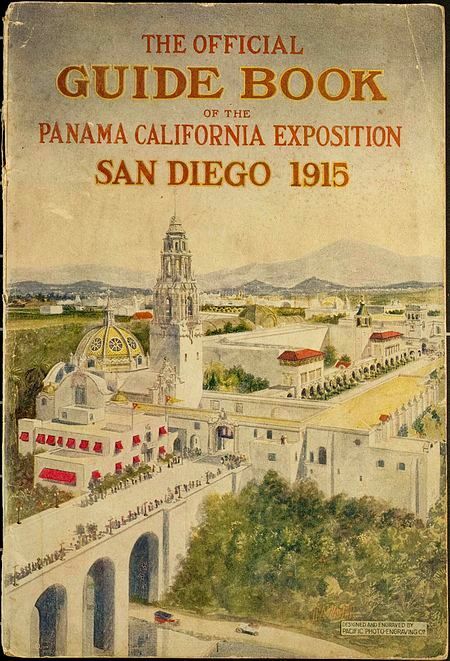 The park located in downtown San Diego, was originally built for the Panama-California Exposition of 1915. It now features many attractions including live stage theaters, music venues, lush gardens, historic walking paths, and fine restaurants. 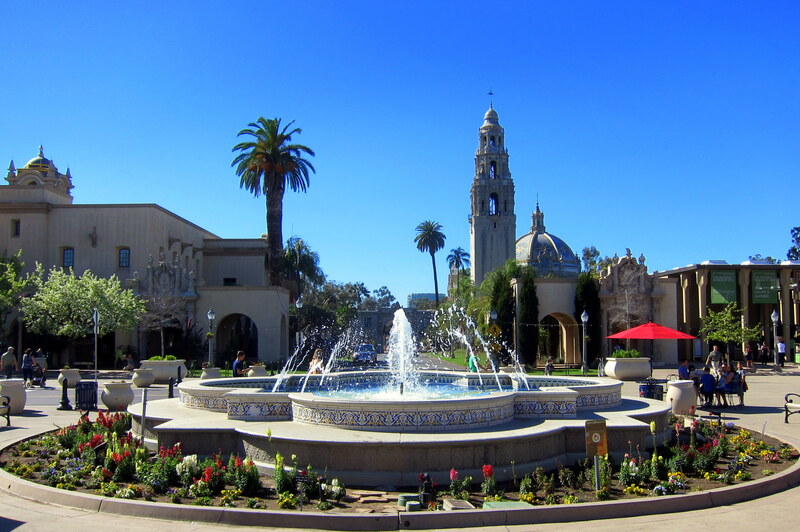 Over the years, Balboa Park has been used for a variety of other purposes, such as the housing and training of military conscripts during both world wars. It is the home of the famous San Diego Zoo and also houses many world class exhibits such as the Botanical Garden and Reflecting Pool. 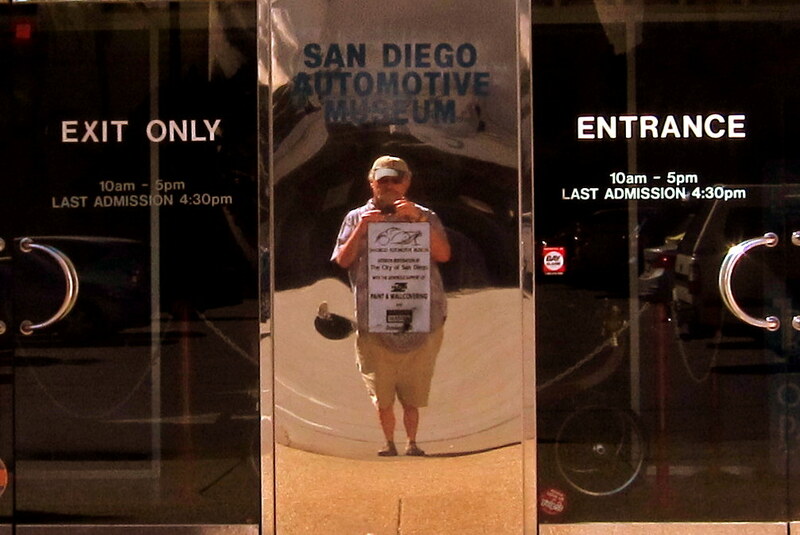 Another one of the attractions in the park is the San Diego Automotive Museum. A nice exhibit of unique automobiles, the small museum contains some of the pivotal motor cars of the past century. Too bad the dork reflected in the photo above can’t figure which door to use in order to gain access. 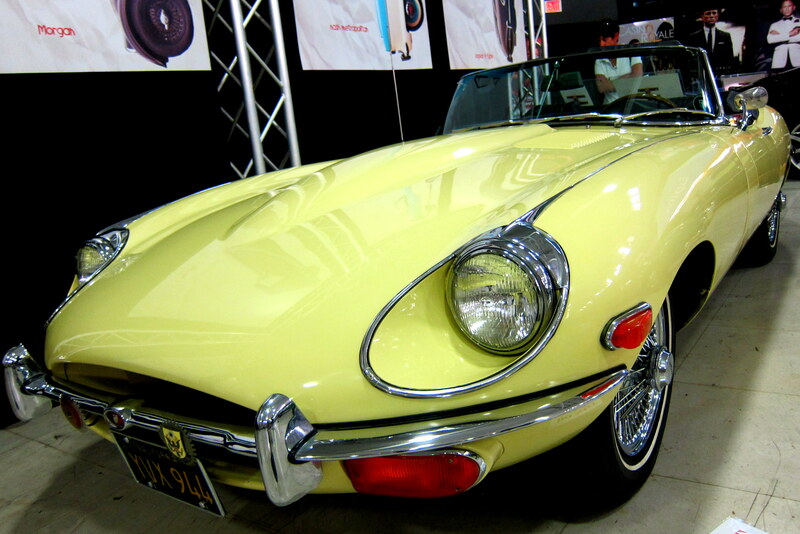 The museum rotates its selection of historic automobiles with other institutions in order to keep the displays fresh…..this month it is featuring cars from the UK, such as the classic Jaguar E Type. In my opinion, the jaguar XKE is one of the best looking cars ever produced, by any nation, at any time, in history! This rolling piece of art looked like it was going 100 miles per hour while sitting static in the museum…..an unbelievably beautiful automobile! Also included in this special exhibit was the Lagonda. Another striking automobile, especially considering it was designed during the depression of the 1930’s. 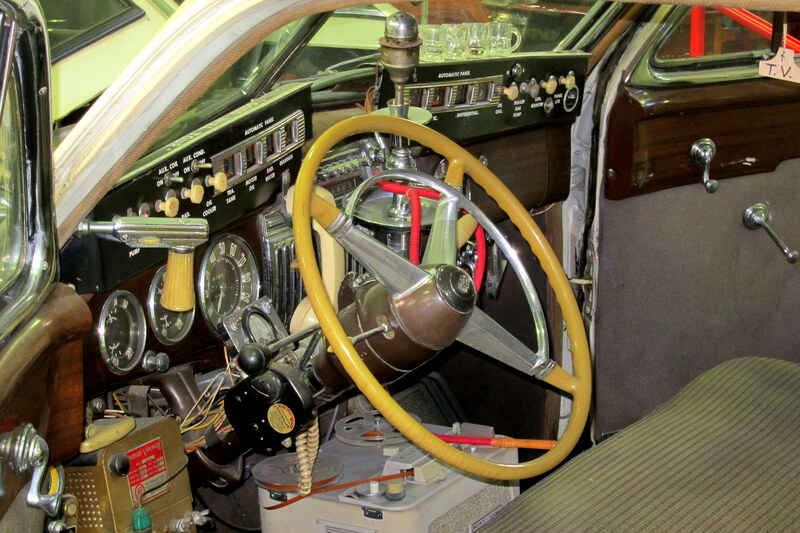 Each V-12 powered Lagonda featured a beautiful aluminum body formed entirely by hand. 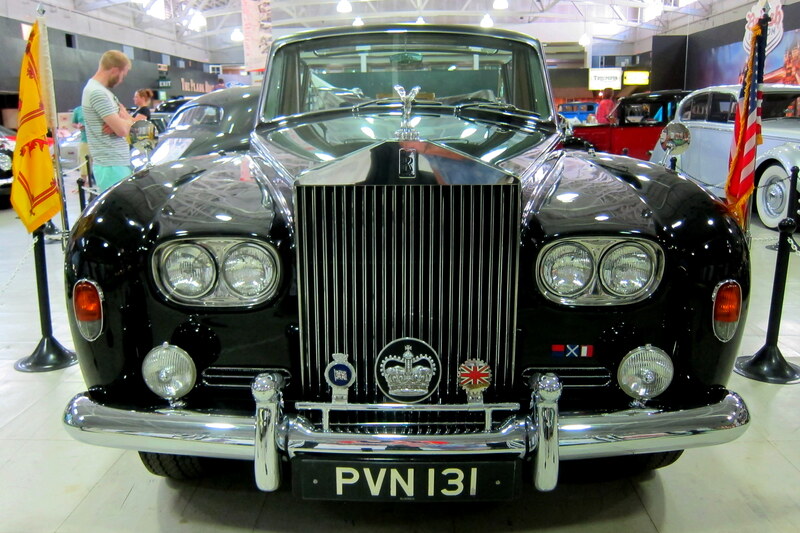 And the iconic Rolls Royce was also on display…..this one a 1967 vintage with an interesting pedigree. During the Russian era of austere socialism, such an opulent vehicle would have been frowned upon, so this Rolls was one of five ordered by a “private citizen” and “loaned” to the party elite for their personal use. Being Southern California, the land of fantastic weather, many vehicles with only two wheels are insanely popular here. 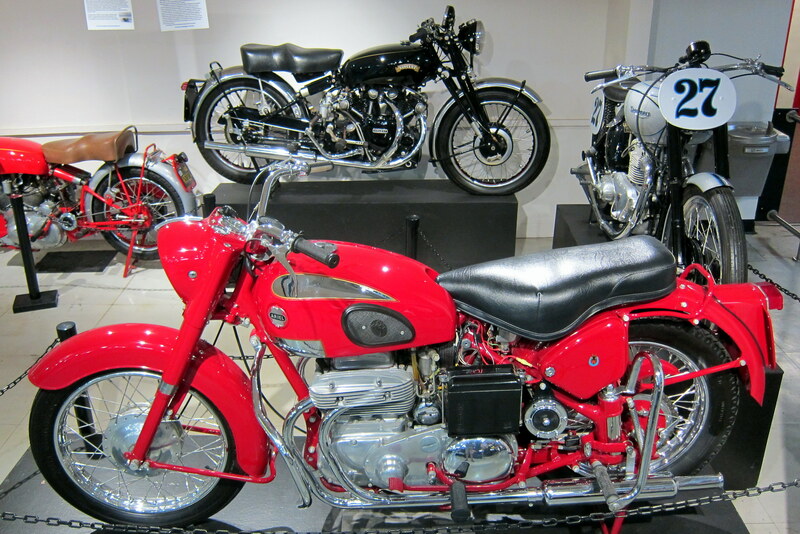 So it stands to reason that some historic motorcycles from the UK were also on display at the museum……most notably, the Vincent Black Shadow (rear) and the Ariel Square Four (front). The Vincent is an incredible machine, and one that I lusted after in my younger years. And the Ariel was a model that Kit’s brother restored and rode about during the 1970’s….the bike was very rare at the time, so this could possibly be his former motorcycle! It was a treat to view so many classic vehicles from the UK under one roof. 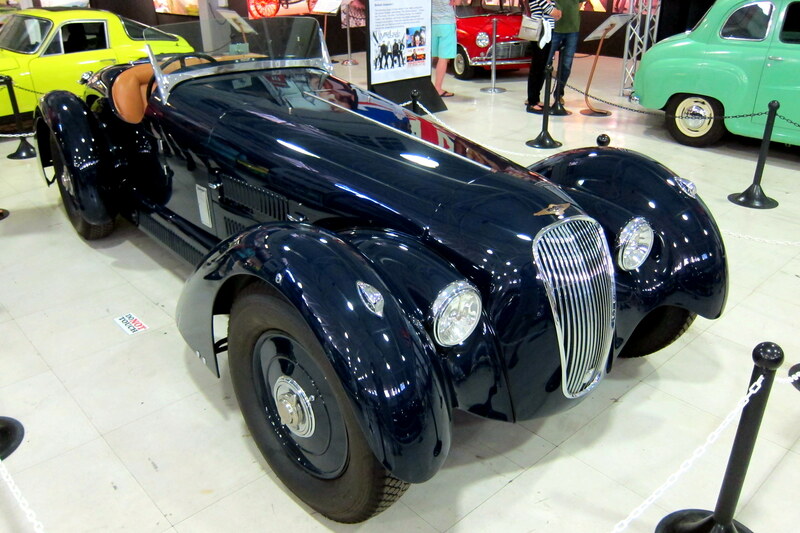 However, also on display are a few unusual automobiles from the museums permanent collection, such as this Tango 600. What? Never heard of it? 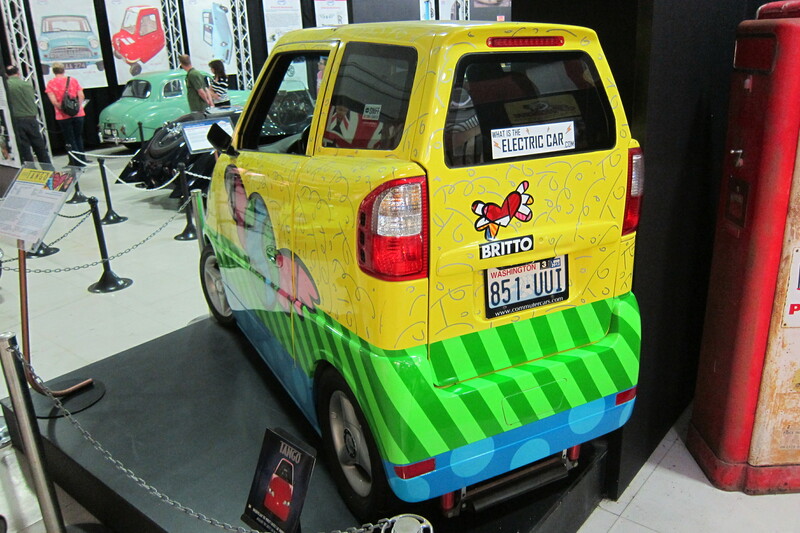 Well, me neither…..apparently this diminutive 100 inch by 39 inch electric commuter car attracted a lot of attention by the moneyed environmentalist in California. At over $100,000.00 dollars a pop, it wasn’t for Joe the Plumber, however George Clooney owned one! The cars four electric motors propelled the tiny thing from zero to sixty miles per hour in only 3.2 seconds…..gotta love that instant torque from an electric motor! 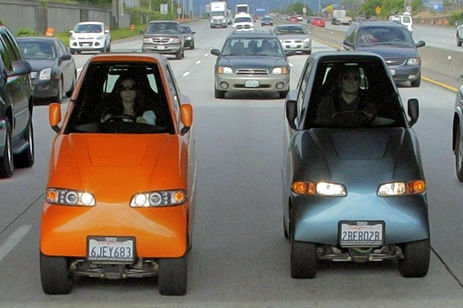 In addition, the extremely narrow track required the two passengers to sit fore and aft, but the cars narrow configuration also allows two Tangos’ to occupy the same traffic lane! Anyone else reminded of the carnival bumper-car rides? The current production figures stand at twenty units, and yes the vehicle is still available if you want one…..as for me, if I had six figures burning a hole in my pocket, I’d get a Corvette Z06! The strangest automobile in the museum is one I had seen many times before, both on the road back in the 1950’s and in this museum a few years ago. 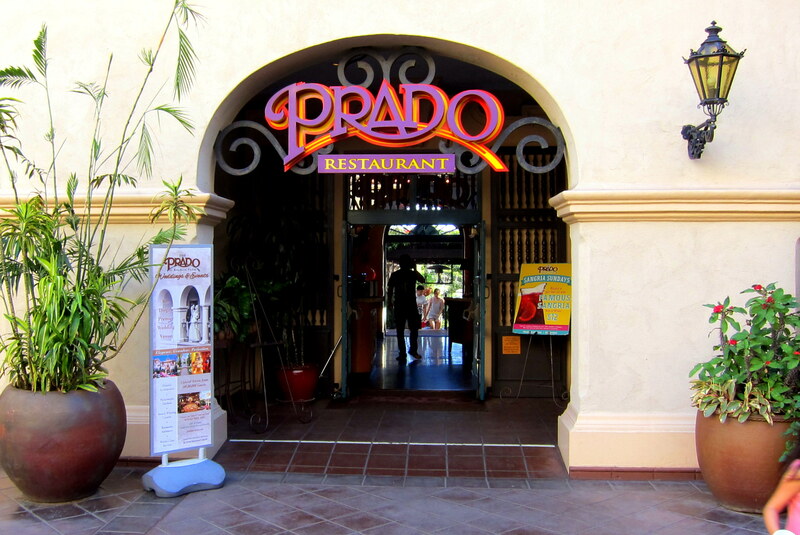 After a morning visiting museums, and walking about the incredible grounds on this warm winter afternoon, it was time for some refreshment…..so Kit and I headed to the renowned Prado Restaurant. The food was excellent, as usual, but this was what I really wanted! 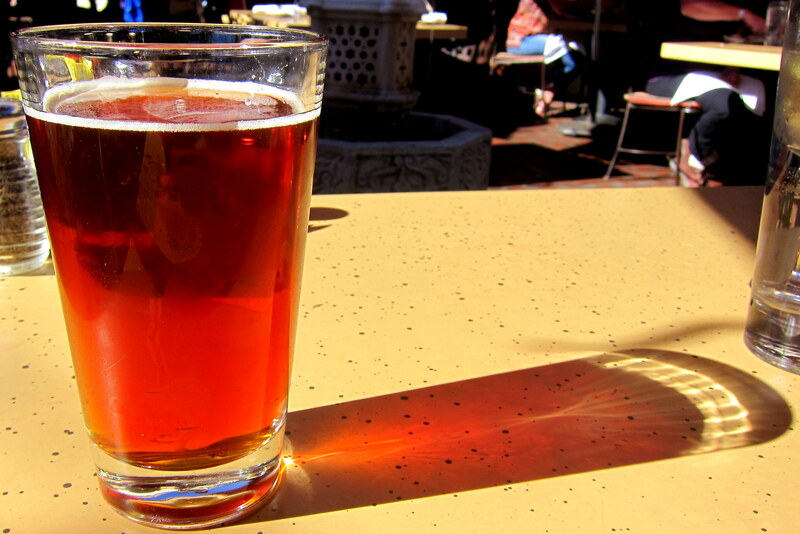 A cold pint of Ballast Point Sculpin IPA…..Ahhhhh! On the way back to the campground we decided to tempt fate and merge onto the Interstate Highway System. This marvel of modern concrete application was initially envisioned back in the 1950’s by the Civil Engineers of CalTrans, one of which was Kit’s father, Frank. Yep, that is six lanes folks, and another two hidden behind the HOV barrier!?!? 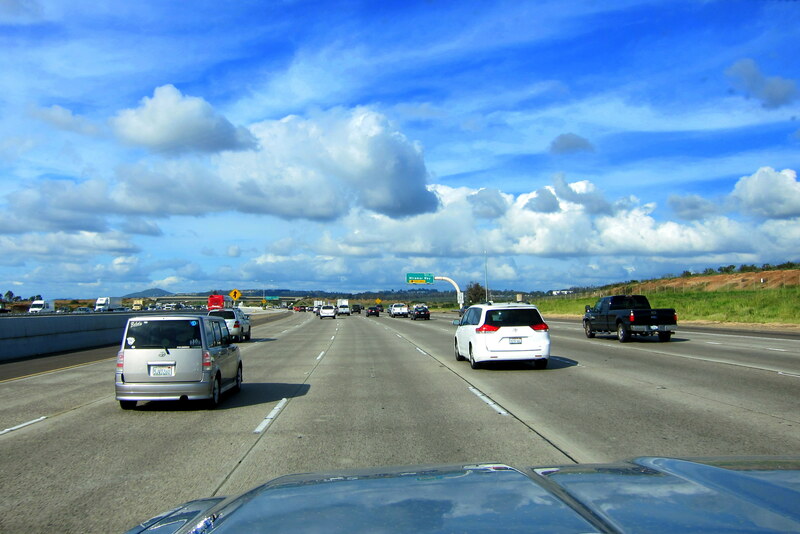 Sixteen lanes of Interstate Highway can become crowded at rush hour, which is when most of us folks that don’t need to be out driving, aren’t! The weather during our stay so far has been fantastic! 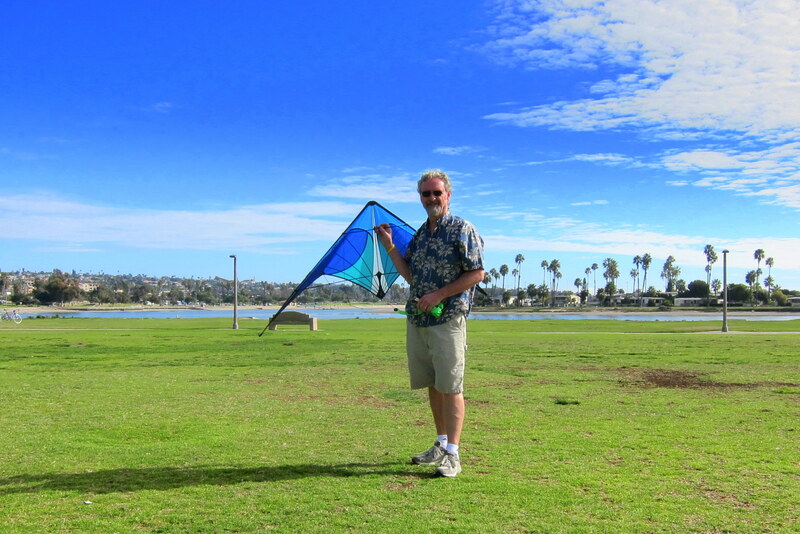 Sunny with temperatures in the 80’s and light ocean breezes…..perfect for kite flying! 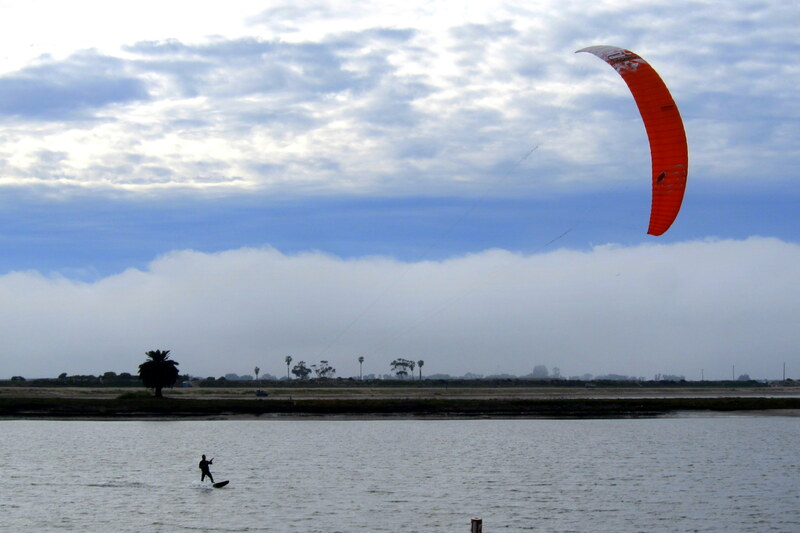 Spent time down at Mission Bay flying a few different kites and had a blast. Kit was content to stay out of the wind and relax with a good Kindle. 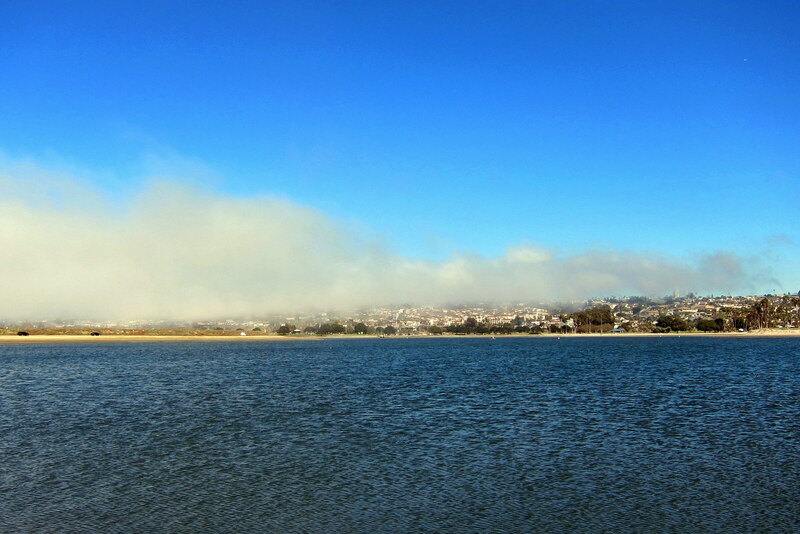 As the coastal fog began to move in, I folded the kites and relocated a bit to the east side of the bay. Where there were folks out with the big power kites taking advantage of the freshening winds. 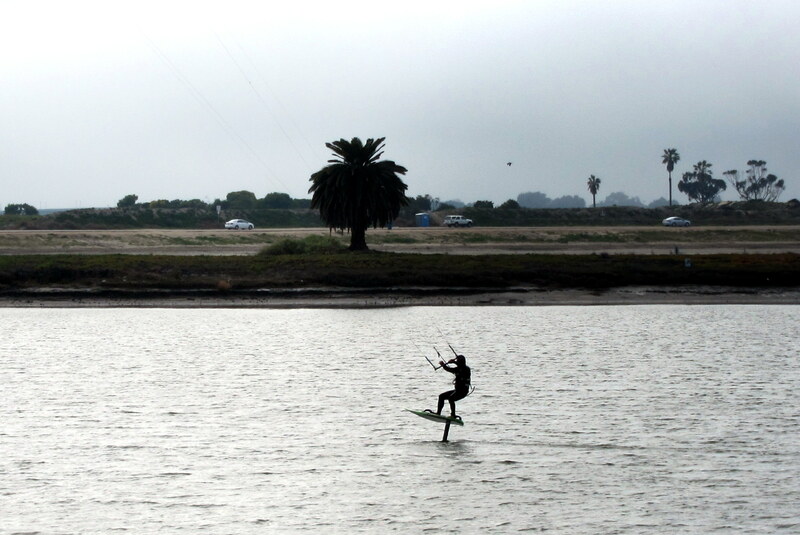 Observed one fellow riding a strange contraption…..a hydrofoil kite board! He would launch off the water like a traditional kiteboarder but at speed the entire board would lift up on two small hydrofoils and the resulting lowering of surface friction would cause the rider to accelerate rapidly! On another incredibly beautiful San Diego day Kit and I along with CeCe, a friend from back in the neighborhood, made a pilgrimage to the National Cemetery on Point Loma where my mother and CeCe’s father are buried. 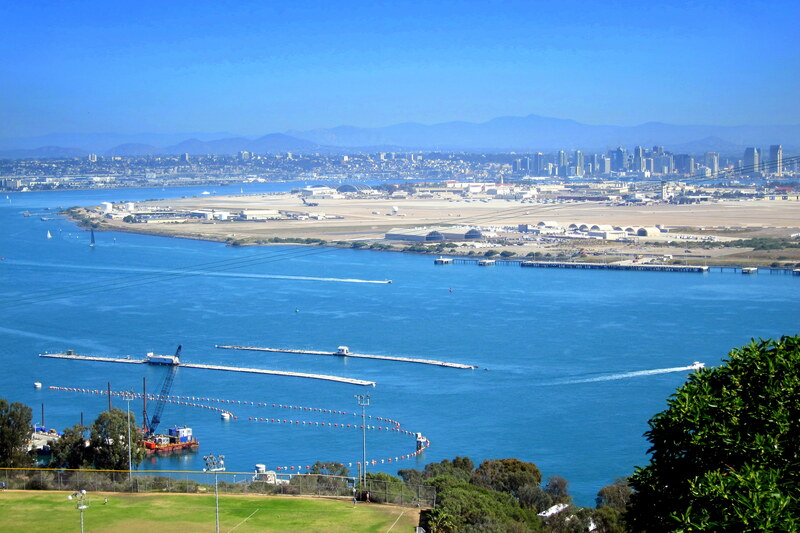 The cemetery is on a promontory overlooking San Diego Bay with its fleet of Navy vessels at anchorage…..a fitting scene for the many interred veterans here. We are sure mom is enjoying the view from her vantage point while looking at all those sharp bluejackets in their liberty blues. Kit was thoughtful enough to bring flowers, which I’m sure mom would have enjoyed as well…..I can sure envision her saying…..“Thanks, those are be-u-te-full”! 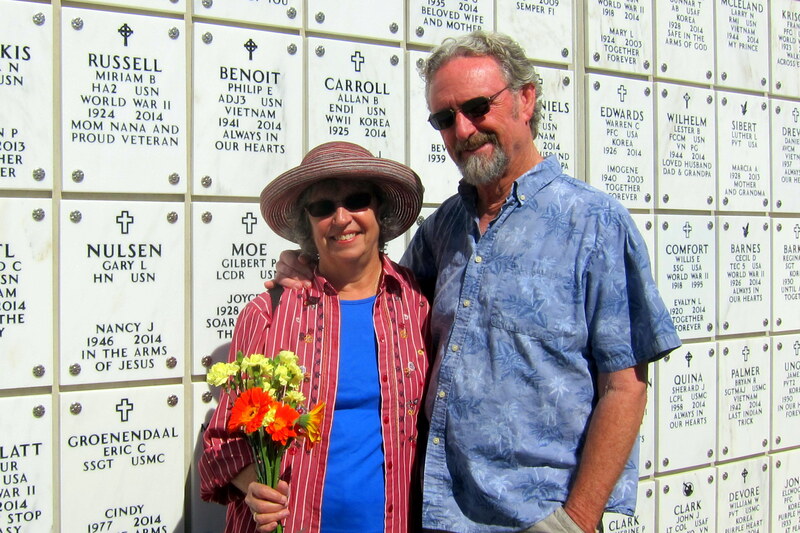 After paying our respects, Kit, CeCe and I headed for an older section of the cemetery. Along the way we began to pick up the unmistakable sound of banjo music and around the corner encountered this gentleman. 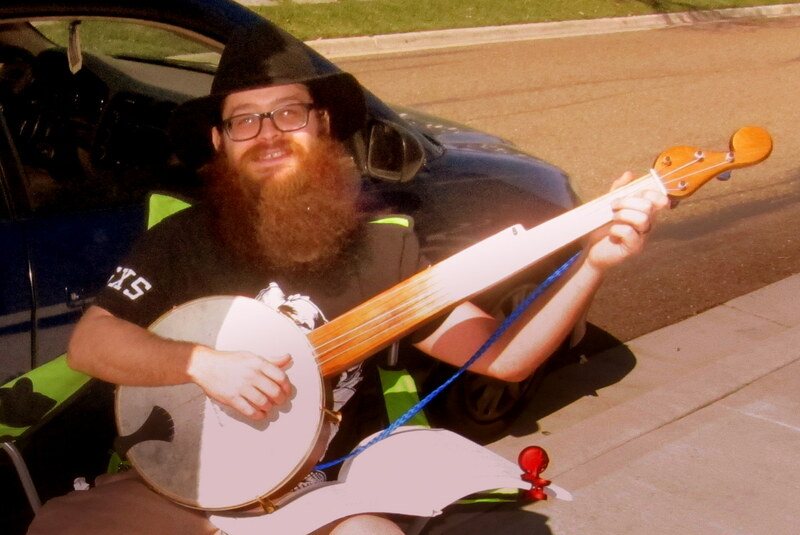 Eric, a fan of 1800’s history learned to play Minstrel Music on an old style banjo using music arrangements of the period. Minstrel Music originated during slavery when owners would send their more talented slaves off to learn an instrument so as to entertain the plantation guests. However, in a slave’s own home he would lace his formal training with native beats and stories which soon became known as Minstrel Music. Every Sunday, Eric sets up and serenades his “Pops” who in resting a few feet away. CeCe has been kind enough to visit mom whenever she visits her father….an act of kindness Kit and I both really appreciate, so we thought it fitting to ask her to join us on this visit and pay respects to her father, Gene Merris. 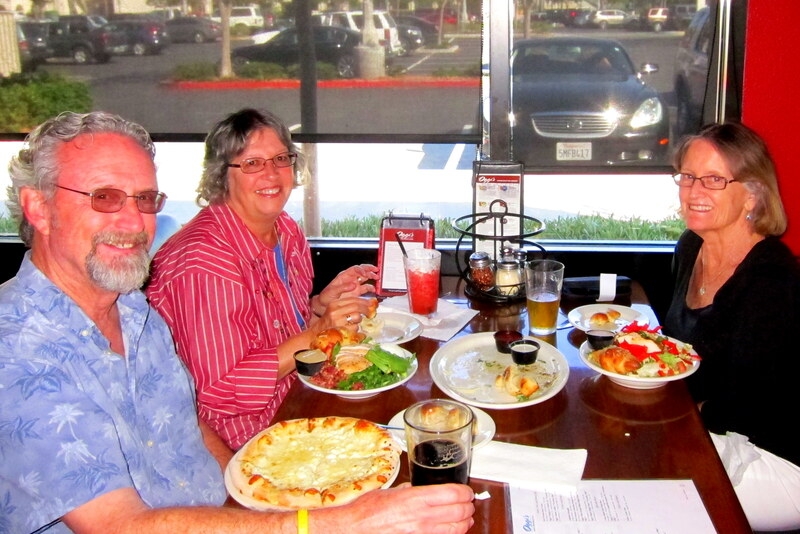 Following our time at Rosecrans, we enjoyed a nice meal and great conversation at a local watering hole housed in the repurposed Naval Training Center now called Liberty Station. 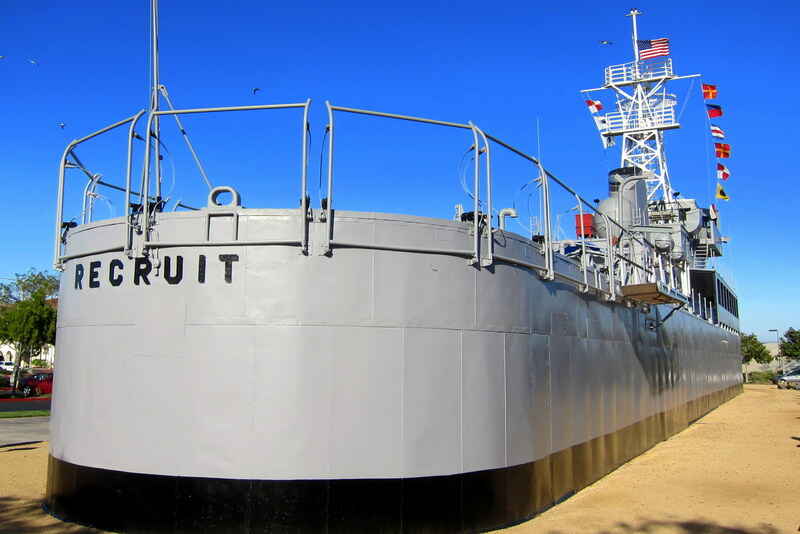 Nestled alongside the restaurant is the USS Recruit, known as the USS Never Sail, a landlocked training ship that I remember from my early Navy career and where I learned seamanship and line handling. 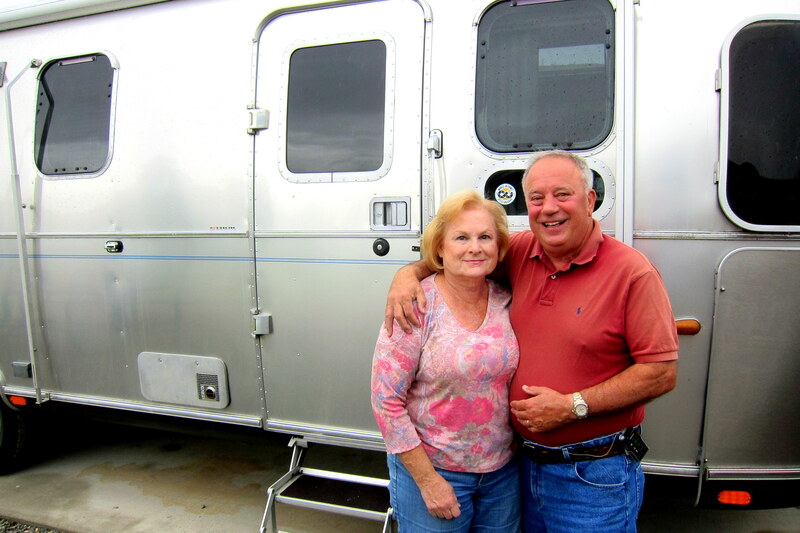 Returning to the campground at Admiral Baker recreation Facility, we were surprised and pleased to find another couple from Maine had pulled in. Fred and Kathy are from the coastal town of Searsport and like us, escape the cold Maine weather to travel the Sunbelt….it was great meeting these fine folks and hope we can connect again this summer. Every few years when back in San Diego, Kit and I take a nostalgic tour of the old neighborhood. 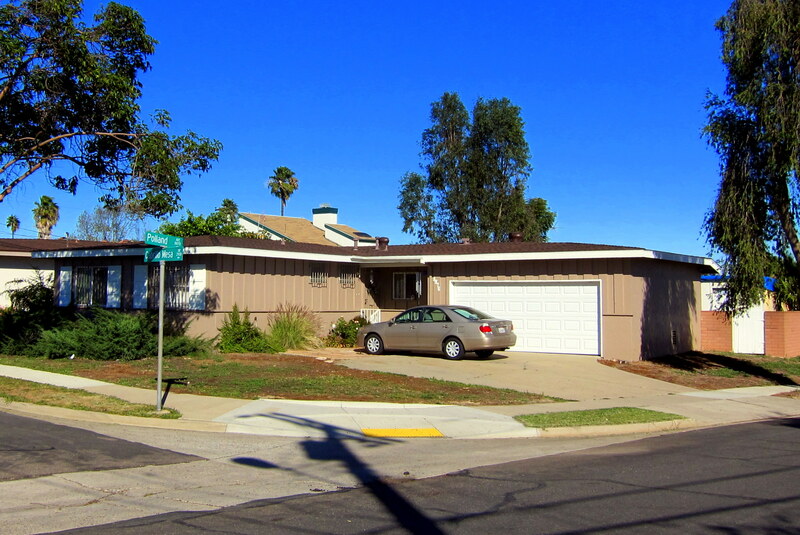 Our first drive by of the morning was the home I grew up on in the Cabrillo Heights section of Kearny Mesa. This basic three bedroom house was purchased new by my folks in 1957 for $12,500.00. Situated in a classic “Leave it to Beaver” neighborhood, my brother Don and I were living the quintessential California dream…..until my father took off! This change to our family dynamics created a few problems, not the least of which was that my mom had to seek employment. One paycheck wouldn’t keep us in our home, so she worked nights at a second job. Add to the situation her desire to date on the weekends and this allowed half the neighborhood kids to hang out at our place without supervision. That two car grange in the photo above didn’t hold a car…..however it did hold a number of parties! And, a few short blocks away lays Kit’s childhood home. Her family, although intact, had its own issues and soon Kit and I were a couple with little control and less money to do much of anything but get into mischief. I believe it was working out of these humble beginnings that has been the catalyst for our nearly fifty one years of togetherness! So, what did kids in 1960’s California do? Well, when not in school, we hung out at the beach or roamed the neighborhood. When resources allowed, we figured out how to shape surfboards out of a block of foam then cover them with a rather crude layer of fiberglass. We also made some of the earliest skateboards out of a 2×8 chunk of wood to which we fastened roller rink wheels. Or, from the “I Can’t Believe I Did This” file, we explored the myriad underground world of the San Diego storm drain system. Yep, that curb-cut in the photo above led to a vast interconnecting network of various sized drainage tunnels that honeycombed the neighborhood. Which we would gain access to by climbing down into the canyons and locating the huge discharge pipes. Since it rarely rained, we were never in any danger of water rushing down the drain, but the lawn watering runoff did create an environment in the tunnels that was always damp. Our biggest concern was getting lost, and when this happened, we would climb the imbedded ladder to a curb-cut and try to figure out where we were. Sometimes, if we saw someone walking down the street that we recognized, we would call out to them. 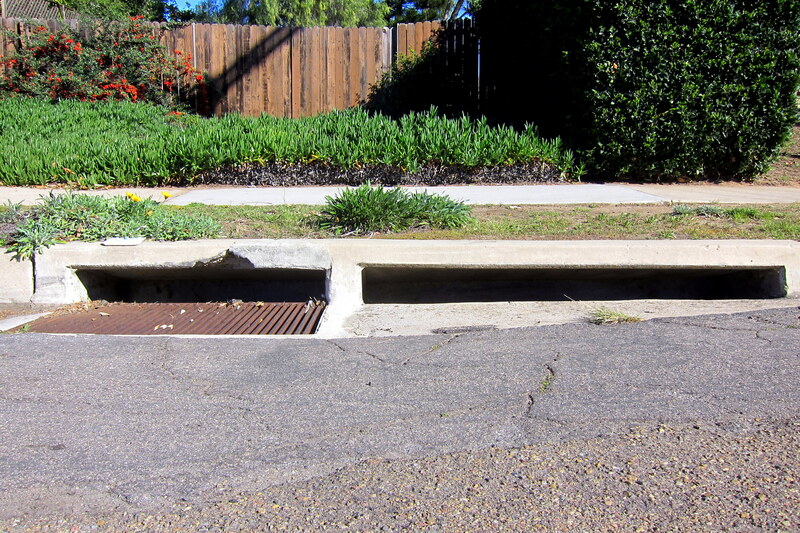 Since we were hard to spot down in that storm drain, this would drive folk’s nuts! Who sez city folks can’t find adventurous fun?!?! Speaking of adventure…..what young person wouldn’t like an airfield within a short bike ride of their home? Montgomery Field, a small un-controlled airport primarily used for general aviation purposes, was a hub of activity and a real attraction to those of us who marveled at the planes of the era that flew over our houses. One such flying machine was a bright red J-3 Piper Cub similar to the one above snapped recently sitting on the tarmac of Montgomery Field. This J-3 could perhaps be the same aircraft, painted the more traditional color of yellow, which was once owned by Trigger, an old family friend. Newly retired in the mid 1950’s from a 20 year Navy career, Trigger learned to fly and eventually became a corporate pilot for the Convair Astronautics Company. 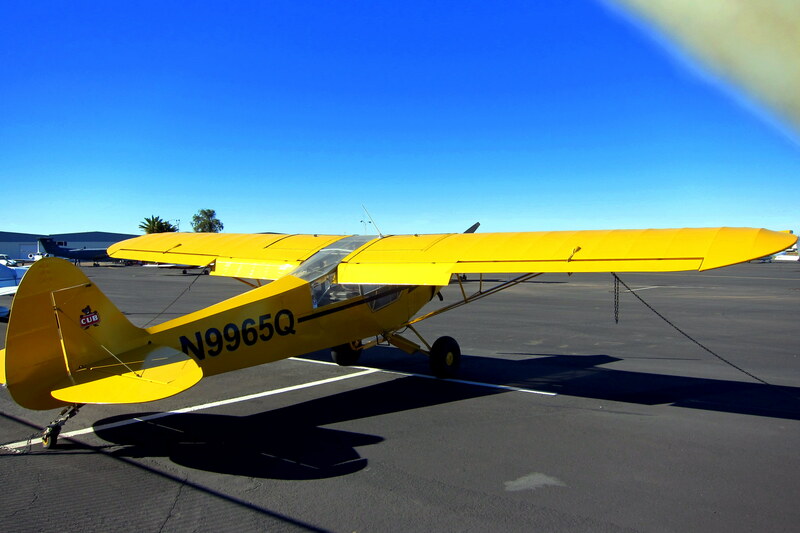 Quickly getting bored with the little Piper Cub, he took a bus to Tucson, Arizona where he successfully bid on an old WWII trainer plane that the War Surplus Department was auctioning off. 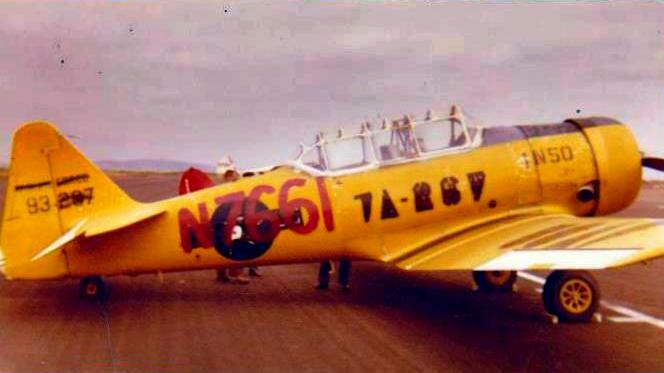 As I recall the family story, Trigger flew his new to him T-6 Texan, which contained no radio or navigation equipment, back to San Diego by following a road map. 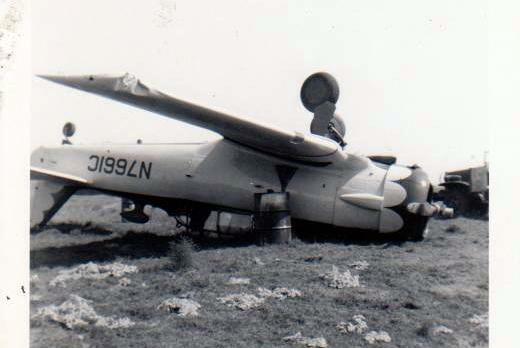 Below is a photo of the actual plane shortly after at arrived at Montgomery Field in 1952. Acquiring a few fellow pilots in a partnership to restore and modernize the venerable old war bird, Trigger used the two seater for flights around Southern California and into Mexico. 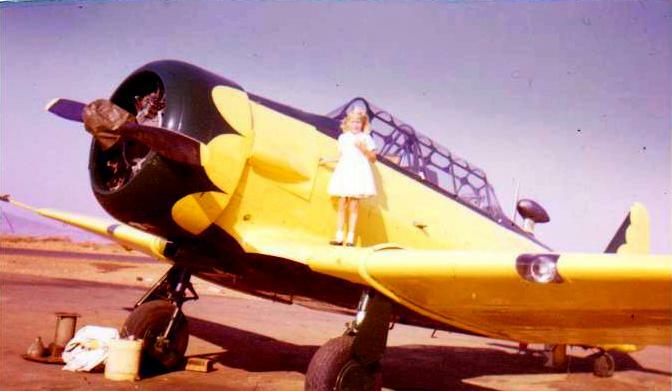 The cute little girl standing on the wing of Trigger’s freshly restored T-6 is his daughter, Christine. Chris, her father, and her mother Betty, lived a few blocks from our home at the time and the families became best friends. The restored military aircraft was a popular sight in the skies over San Diego.…..well, until one fateful day when another partner brought the plane in a bit too hot, panicked, and flipped her over nose first. Fortunately no one was hurt, but unfortunately the damage was severe enough that getting her airworthy again was beyond the partnerships budget, so the old girl was sold. After that, all track of N7661C was lost. Directly across the street from Montgomery Field lies a new library. The original neighborhood library building is still standing and appears to be in fine order but, as in many places in California, apparently “newer is better”, so a nice new library has been built on the outskirts of the community. Kit, being the reader in the family, always enjoys poking about libraries and book stores. So as she spent time in the library, I took a walk about the surrounding area, one which is mostly commercial/industrial and seems an odd place for the community library. That is until Kit explained that the land, and funds for building, was donated by a member of the San Diego Charger Football organization. It’s been a great stay in the Mission Valley region of San Diego. The weather has been fantastic and we have thoroughly enjoyed exploring our old stomping grounds. However tomorrow we head out to camp in another area of the county…..Stay tuned! Kit’s Bit’s: Being older (and, maybe wiser, but not sure), we are beginning to appreciate the city in which we grew up! We’ve always heard of the many neat places to see and great spots to visit but, when we were kids, our parents never had time to take us to all these places. Then, when we returned to SD in April of 1970, we had two kids of our own with the third on the way; we never had much time to explore. We lived there until February of 1976. Each of the places we visit now, we are in total awe of how beautiful the area is! San Diego, although quite large, is easy to navigate and has so many incredibly beautiful qualities. Even the old “run down” neighborhoods have been gentrified and are so cozy now. 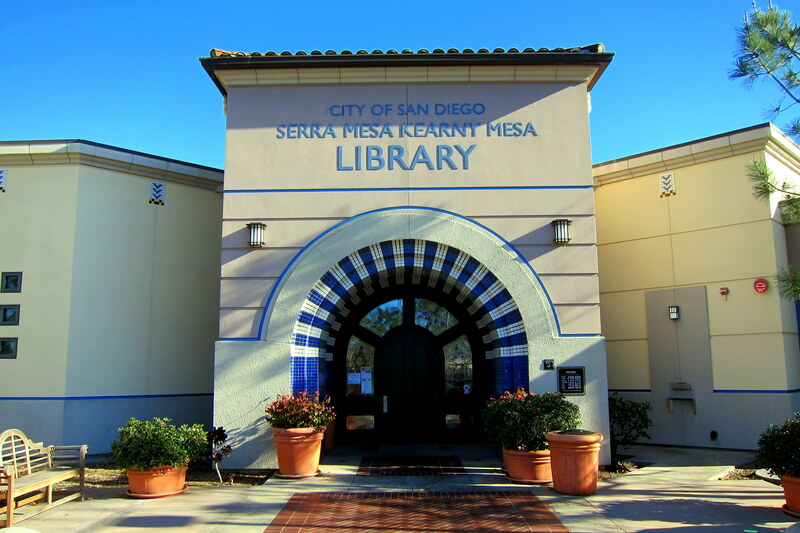 The new library is located between Serra Mesa and Kearny Mesa. It is a better spot to serve both communities. The old library, which was a two minute walk from our house, was my get away place to have some quiet time. With both my parents working, my mom worked nights, it was my responsibility to care for and feed the younger 4 kids. Once I got them fed and cleaned the kitchen, I ran off to the “library” to get some peace and quiet. 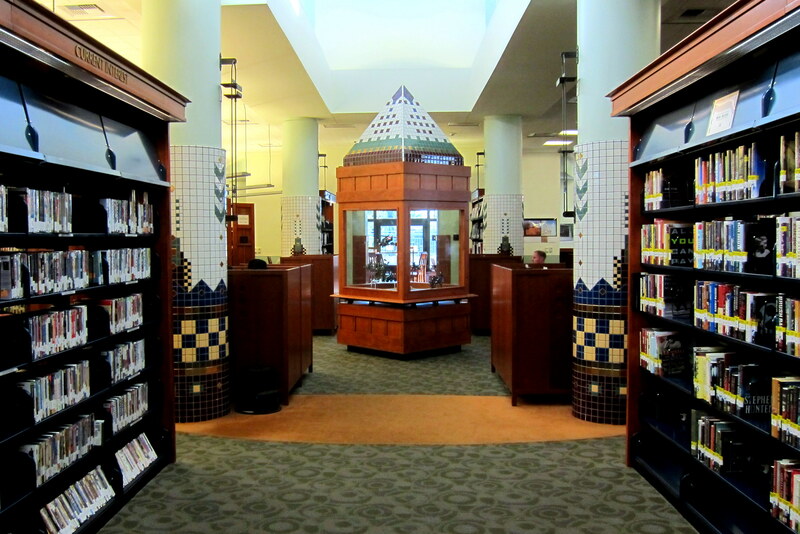 Thus, my love for libraries! Today, they have become community gathering places rather than a quiet spot, but, all in all, that’s a good thing! I always enjoy the time we get to spend together, no matter how,short. That our friendship began by telling you about my crush on Doug Cook, while he had a crush on you, says a lot about the cameraderie of growing up in the same neighborhood, with the same unspoken trials and tribulations. Looking forward to your next visit! Love you both! THE CROWN JEWELL OF THIS ADVENTURE IS THE PICTURE OF THE YELLOW JAG. JEANNE ALWAYS WANTED ONE, BUT I KNEW TRYING TO KEEP THE MULTIPLE CARBS ADJUSTED WAS NEAR IMPOSSIBLE. WE DO LIKE THE NEW ONNNNNE THAT FORD HAS REDESIGNED AND REPOWERED. JUST WHAT WE NEED TO GET THE BHAM TONGUES A WAGGIN!! THE RETURN TO YOUR OLD HAUNTS ESPECIALLY THE STORM DRAIN SYSTEM IS QUITE INTERESTING. STAY SAFE AND WE LOOK FORWARD TO YOUR RETURN. Howdy ho folks! Vince was on northern woods today with Candy. Wardens stopped his party to check registrations and such! Need to get his autograph. Getting warmer with long daylight hours. Glad to see your blog and all is well! What a nostalgic visit to SD this has been for you two. It was very nice learning of what your lives were like as kids. I can understand now how you acquired your sense of adventure as adults. Exploring drainage tunnels? Wow is all I can say to that one!! It’s so nice to see SD through the eyes of friends who have lived there. I would be so tempted to move back! Bill, your mom has such a beautiful eternal resting spot. Sounds like she more than earned that. Kathy, you must be very proud of your dad having been so involved in that planning of that very extensive highway system! I imagine seeing that would make you miss him so much. Thanks for sharing your hometown with us…..what a great place to have lived…..and loved. Having shared that with each other as kids I can see why you two have such a solid marriage. Thanks for including us in your blog! We are looking forward to reconnecting with you guys this summer back in Maine. Until then, safe travels and keep up the great work! Although I have never been to San Diego and Sterlin has never lived there, this brought back memories! Sterlin had always said that he was going back to homecoming after college graduation with a Jaguar XKE. Well, instead he went back with a brand new wife and never did get that Jaguar XKE! Thanks for all of the memories that are triggered for us by memories that you share! Keep on enjoying the ride. We love and miss you both. Thanks for the tour..My daughter Sally and I hope to be visiting Sam Diego next winter. My grandson is in school there getting a degree in computer sciences . No car museum is complete without a Tucker! Thanks, Bill, for the “trip through memory lane” in San Diego, me being a Serra Mesa brat! I remember Kit’s house, but I never saw yours! 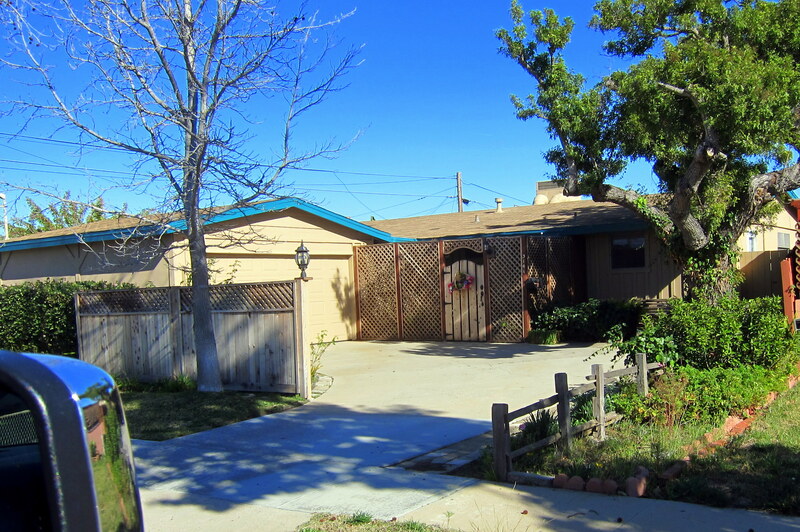 The houses in Serra Mesa/Kearny Mesa all looked so similar back then – mine closely resembled yours. I don’t remember Kit’s house being in Kearny Mesa – mine being in Serra Mesa just at the top of the enormous hill from the Mission Valley stadium – but then I believe that Kearny Mesa and Serra Mesa just blended into one back then, a blended line. I know I never had trouble getting myself to Kit’s house so it couldn’t have been far away – I surely never took a bus to get there. Probably my trusty bike! I think it’s wonderful that they have established a “Serra Mesa/Kearny Mesa Library,” the two locations having been “married” for so long. 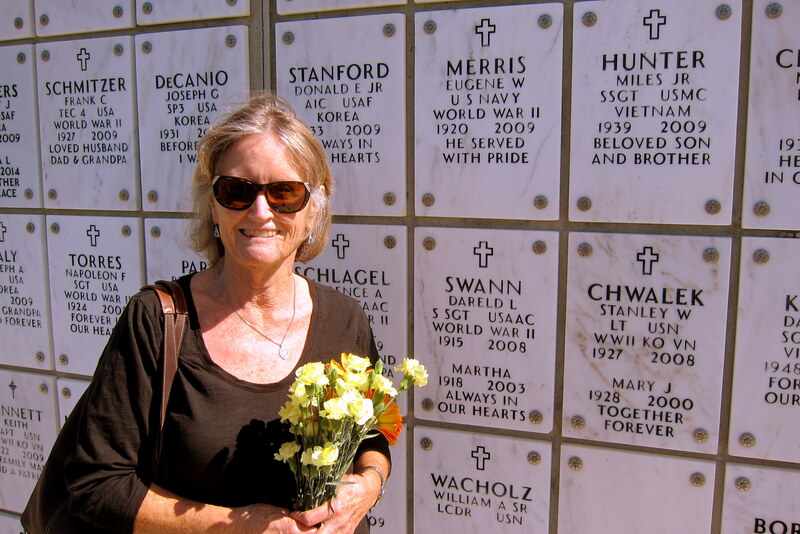 I loved your visit to the Ft Rosecrans National Cemetery wherein my Naval officer dad is also interred. Such a peaceful, beautiful place. Montgomery Field – a wonderful memory for me as my dad was the “San Diego Airports Director,” a fancy title for Dad being charged with managing San Diego County’s light aircraft Montgomery Field in Kearny Mesa and Brown Field, north of Montgomery Field. I remember Dad arranging for me and my siblings to “catch a ride” on the Goodyear Blimp which used to park (moor?) at Montgomery Field!! That blimp ride terrified me though I was 16 years old – very strange indeed – total silence, no “engine” SOUND whatsoever which was unnerving to me. Dad used to fly himself to Brown Field twice a week. In elementary school, around 3:30p-4:00p, we would always LOOK UP at planes flying over our home on Rebecca Avenue, a short distance away from Montgomery Field in a landing pattern. If the Cessna’s wings were “waving” at us, that was Dad! All my neighborhood friends would spring handstands and give Dad high fives back atcha to him – such a wonderful memory and my dad loved looking down at us going bananas. All the kids in my neighborhood loved my warm-hearted dad. Loved your blog re San Diego, I grew up in North Clairemont, and have lots of memories like yours. My elementary schoolyard was locked on weekends, but it didn’t stop us from using the large drain pipe from canyon to center of school yard, and the grate lifted off. Then we could play tether ball etc.